Every day through October I will be pondering and revealing my 5 favorite horror and monster movies from 1985 right up to 2016. When I was told I get to pick FIVE movies per year I initially thought this would be a fairly comfortable task. I’m one of those people who likes lots of movies but I only truly LOVE a select few. That did NOT make things any easier. This has been incredibly difficult, and there have been so many years where I could have happily selected 10+ films. Until you attempt something like this you simply don’t realize just how many horror movies you have a passion for in different ways! I’ll keep my reasons for selecting each movie brief, simply because I have to produce this every day for a month. The challenge starts with 1985, when I was 9 years old, and that’s pretty much exactly when I moved on from cartoons and family movies and began exploring the good stuff! Going back 31 years turned out to be the PERFECT place for me to start a journey into my movie watching past, and that made taking on this challenge a fascinating and rewarding experience. I WANT feedback, and I would love to read your choices if you feel like getting involved. Movies from heaven, it’s 2007. You can pretty much guarantee that anything directed by Frank Darabont will be a high quality production, so it came as no surprise to discover that The Mist continued this fine tradition. The man just has a talent for SQUEEZING out every drop of intensity, emotion and drama that lurks within a story, no matter how much fantasy or horror might be involved. Some really strong performances are delivered by an experienced cast, and that makes it easy to worry about their characters as they fight the dimension-hopping monsters on the outside, and the HUMAN monsters inside. I’ll be honest, I don’t actually think this is a particularly well-made movie, but if you’ve been following these articles recently you’ll know that I always respect and promote movies that somehow manage to get under my skin. If that happens then I’ve had an EXPERIENCE, and after watching thousands of horror movies over the years it’s pleasing when something comes along that makes me wince and feel uneasy. It’s a sadistic and nasty little creation, but I think the filmmakers NAILED what they were obviously trying to achieve. Let’s face it, this movie is basically a GIFT to everyone who loves the Halloween season. Little Sam has already become a new horror icon, and his journey through the wonderfully connected stories perfectly captures the dark magic and atmosphere of that night we love SO much. The tales are timeless, and the message is clear … Respect Halloween! I Wasn’t expecting much the first time I watched [REC. ], and after about 20 minutes I hadn’t seen anything that really changed my mind. But then things start to happen, momentum starts to build, and the deeper the characters travel into that doomed apartment building, the more you feel yourself being pulled into the story with them. Just one year later, REC. was remade and given a new name (Quarantine), but I recommend you watch this original version if you can. It’s darker, nastier, and the climax is far more disturbing. I had a hard time deciding which movie to pick last for todays list. There were several options that I like and admire, but nothing else that REALLY jumped up and shouted “PICK ME!” … So I’ve gone for a movie that perhaps deserves to be listed no matter what I personally think of it. 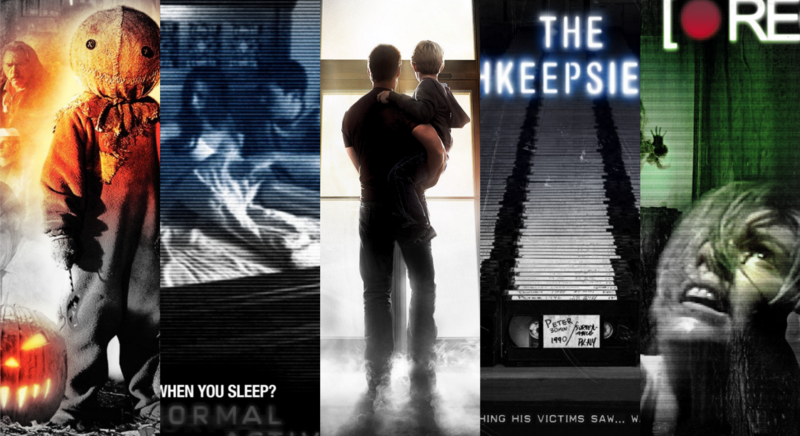 Paranormal Activity became a horror movie event the like of which we rarely see, and thanks to incredible word of mouth it finished its theatrical run as one of the most profitable movies of all time! The quick-fire sequels became a bit tiresome, but I must admit it was cool to see a tiny horror movie become a terrifying experience everybody wanted to scream and shout through.